The current price action from the 11170 level seems to be within parallel lines and looks what one would refer in Elliott Wave terms as a Zig Zag type of structure. 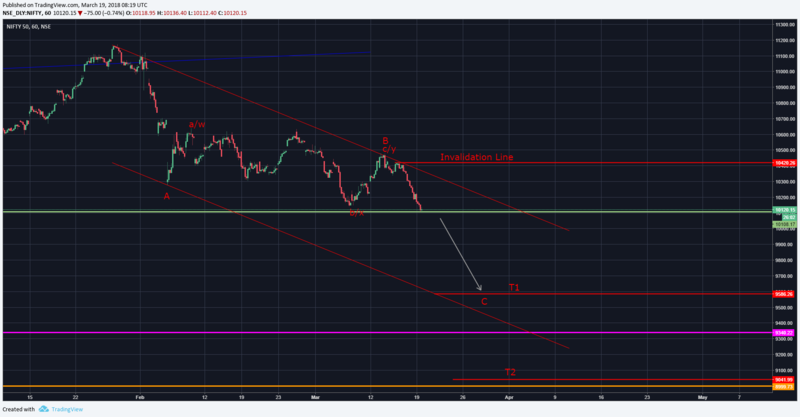 This market did deceive us in with a Wave B as a Running Flat (Can also be interpreted as a Complex Correction) however since the Price Action is still within the channel I expect to see a bit more downside in the coming sessions. Also since we have previous support coming at 10100 level we can expect a bounce back from this level before any possible downward continuation. If this market goes above 10420 level without registering any lows as suggested then this count will be Invalidated.